Why choose Chinese herbs for my horse? The written history of Traditional Chinese Medicine (TCM) and Chinese herbs dates back at least 2000 years. Consequently, we benefit from several thousand years of field trails, knowledge and experience. 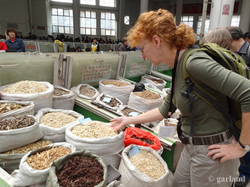 TCM continues to grow and evolve as we explore new areas of science. Science, in turn, deepens our understanding of how herbs work. Today there are many volumes of pharmacological data to support the use of herbs. One of the major benefits of Chinese herbal remedies is that, used correctly, herbal formulas have very few of the negative side effects often associated with drugs. Chinese herbology differs from other forms of herbology in several ways. The most fundamental is the concept of the individual as a unique whole rather than focusing on a symptom or a set of symptoms. Based on a horse’s unique elemental profile, the Chinese herbalist will consider the manifestation (symptoms) as well as the root or constitutional cause of the problem. For example: for an overanxious, nervous horse a non-TCM herbalist might recommend the single herb, valerian, alleviating only the symptoms. A TCM herbalist views the horse’s anxiousness and nervous emotional state as the manifestation of a deeper problem and combines a number of herbs to address the outward symptoms of nervousness and anxiety, plus herbs directed at the root cause of the problem. Thereby, both the source and the manifestation of the disorder are remedied simultaneously. Addressing the whole horse and not just the symptom is the hallmark of TCM and the key to its effectiveness. This philosophy is the foundation for all Whole Horse Herbs formulations. When used properly and thoughtfully, However, Whole Horse Herbs in no way advocates herbs alone. Proper veterinary diagnosis is critical to the formulation of an effective treatment plan. All herbs are selected from the most reputable sources and are blended by Whole Horse Herbs. Whole Horse Herbs are preservative free. We use only sulfur-free, chlorine-free and aluminum-free herbs. Our formulas are never irradiated or gas sterilized. They are tested for heavy metals, contaminates and comply with International GMP standards (Good Manufacturing Practices) as defined by the World Health Organization. When should I use Chinese herbs? Whole Horse Herbs advocates using the right tool for the right job. Pharmaceuticals are effective tools in the case of colic, acute traumas, and life threatening situations. Herbs work well for chronic, stubborn or non-life threatening conditions. Whole Horse Herbs formulas are sold as nutritional/feed supplements and are not intended to replace advice or treatment from your veterinarian. We do not recommend herbs during pregnancy due to liability issues.